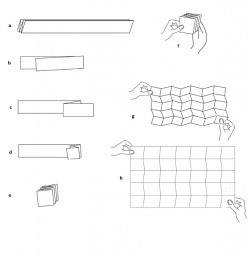 Koryo Miura is Japanese space scientist who invented a new way of folding a map so that it pulls open and closes with one pull. The folding technique is based on the way that tree leaves open from the bud. To make a map, take a sheet of A4 and mark it out in 5 equal strips lengthwise. Fold along the lines accordion-style until it is a single narrow strip. Fold the end of this strip in the ratio 4:3 but skewed at an angle of about 6 degrees from a right angle. Fold the little end back and parallel to the original sstrip to make a skewed square. Fold up the short end into three equal cells and then do the same with the long end - 4 cells. You will now have a single map with the cells slightly skewed so that they overlap. Grasp the end sheets and pull it open in one. Then put it back, also in one.